Sunday “gravy” day is a popular family dinner night, especially for Italians. I grew up in a town with a big Italian influence. I remember hearing my friends talk about Sunday family dinner with grandmom’s or mom’s “gravy”. I am not Italian, so I call this ‘red sauce’ and we do family dinners on Tuesdays. I did love going to my Italian friend’s houses because it was filled with laughs, awesome homemade food, family, and loudness. When I counsel Italians and we talk about pasta, I may give them some healthier alternatives, but I encourage them to enjoy their staple in their family. To keep portions in control, I encourage adding a salad before or veggies within the dish to bulk it up. Personally, I am not picky about my pasta. In my house we enjoy chick pea pasta or these Trader Joe’s cauliflower gnocchi. I also enjoy that I could eat more cauli gnocchi versus the potato ones. 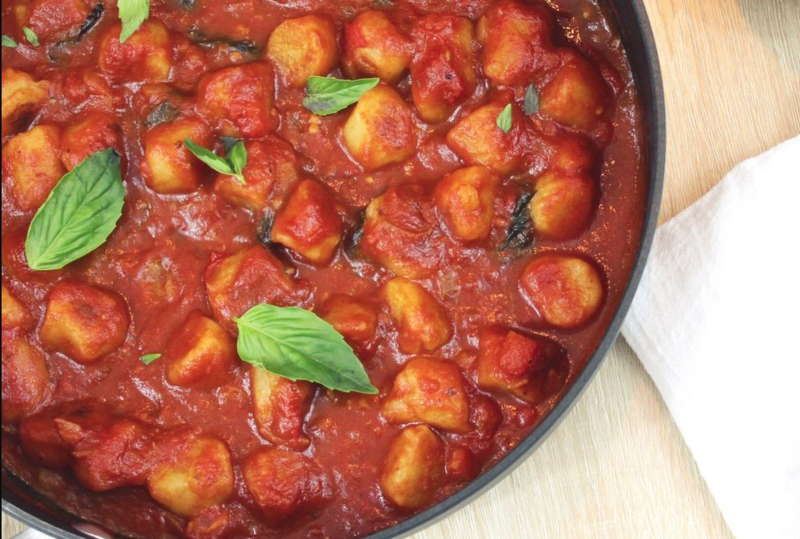 Here is a simple red sauce with cauliflower gnocchi, feel free to add some veggies in there! In a sauce pan, heat olive oil on low heat, add fresh parsley and basil and saute for 3 minutes, to bring the aroma out. Add garlic and onion. Continue to saute for 3 more minutes. Add tomatoes, tomato sauce, and oregano. Cover and keep sauce on low to medium heat. Cook gnocchi NOT per package! Cook gnocchi with a little oil OR little water to prevent a sticky gnocchi. Add sauce to gnocchi, top with basil and Parmesan cheese.